The current home screen on my new Droid X.
I’ve been very lazy about updating over the past two or three weeks. I won’t go back and rehash everything that I’ve been up to because, honestly, it’s not very interesting and I’ve got much nerdier fish to fry. What I will talk about however is the fact that I finally switched from AT&T to Verizon Wireless, huzzah! Along with the switch came a new phone, of course; instead of my old HTC Aria (which I loved, by the way), I am now the proud owner of a Droid X, a behemoth of mobile joy which sports a glorious 4.3″ display and packs a whopping 1GHZ processor (i.e., the same as my netbook, crazy). I picked a really great time to move over to Verizon and get a Droid X for two reasons: the Droid X just got the oh-so-amazing Cyanogen Mod 7 about a week ago and I slid in under the wire just in time to be grandfathered before Verizon killed its unlimited smartphone data plans. So yeah, awesome timing! That said, I have really, really been enjoying the Droid X. (The hardware, at least. 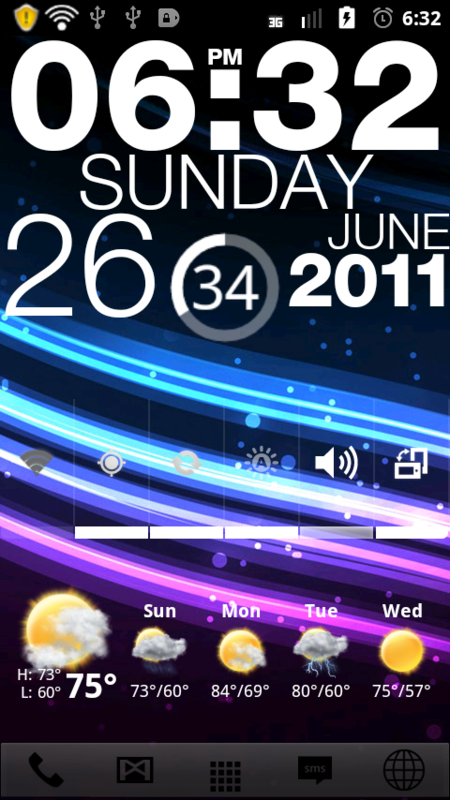 I can’t speak for the software as I’m running CM7 and not Verizon’s Motoblur-infused version of Android 2.2.) Having such a huge screen to watch YouTube videos, play the occasional game of Words with Friends, and surf the web on has been really nice. Throw in the fact that Verizon actually doesn’t drop calls every five minutes like AT&T, and I’m a really happy customer. There’s also the fact that I feel like I’ve barely scratched the surface of the capabilities of Cyanogenmod 7, too. It’s still in beta for the DX, so not every single feature is available yet, but I’m really loving what I do have access to. My next upgrade discount isn’t until February 2013 (! ), but I definitely feel like this phone will serve me well during that time. 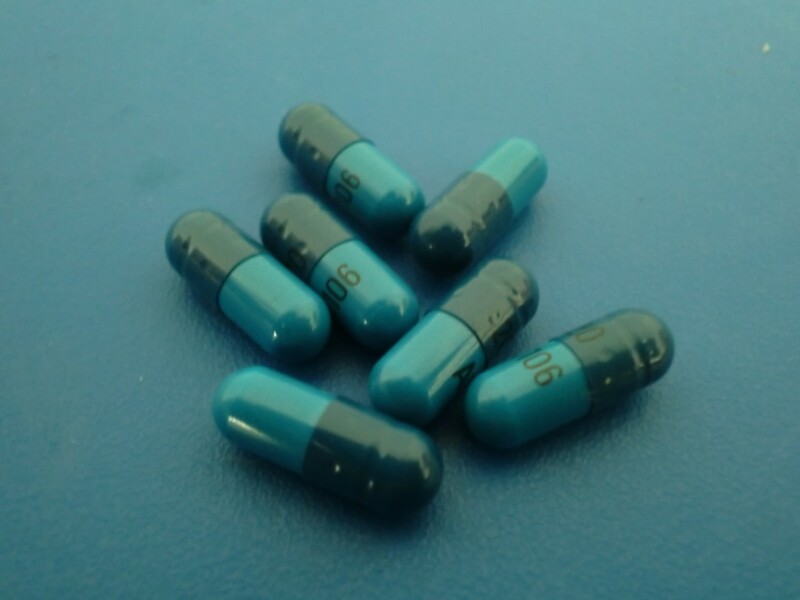 This post was very disjointed and nerdy, but at least it was something, right? Also, week four of my 52 weeks project will be up later today or at sometime tomorrow for all two of you who are following that. "Everything that's keeping me together is falling apart." 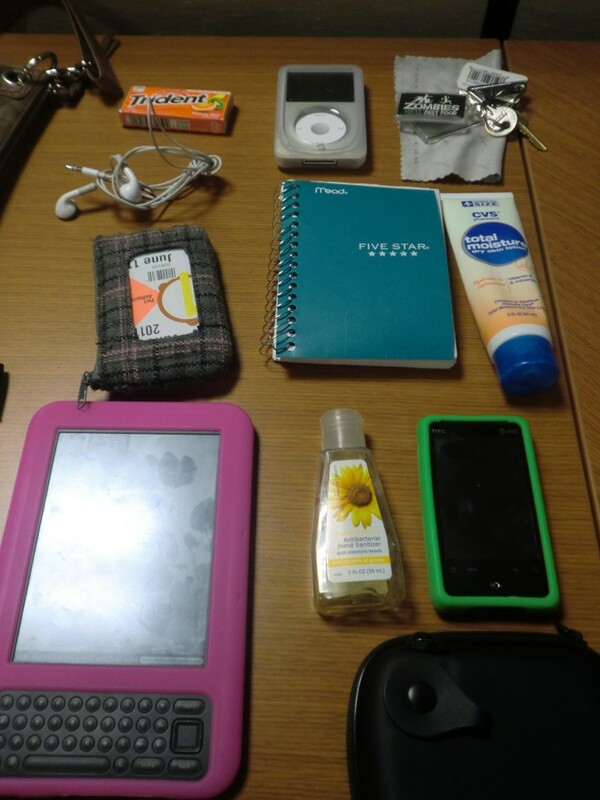 From bottom Left: Amazon Kindle 3, hand sanitizer, camera case, HTC Aria, hand lotion, spiral notebook, change purse/wallet, headphones, gum, iPod 5th Generation, glasses cleaning cloth, keys. Well, my gentle reader, it seems as though I have down with a cold. Yes, a wonderful summertime cold. Hooray. With that disgusting, germ-laden declaration out of the way, I suppose we can move on to matters which are more interesting. 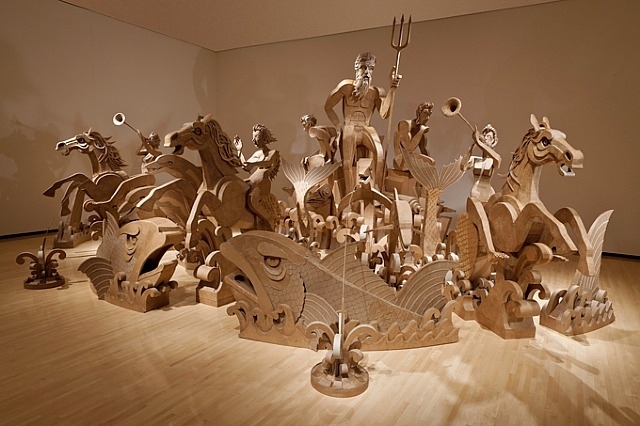 The most badass piece of art, ever: Corrugated Fountain by James Grashow. Doesn't this just make you want to whip out a book on Greek Mythology!? I went on a date with a guy that I met on les interwebs Sunday and it was okay, I guess, but I don’t have any plans on continuing to see him. He was a nice enough guy, but not assertive and confident enough for me and I didn’t feel overwhelming compelled to kiss him at the end of the date, so needless to say, there won’t be a second date. Even though I wasn’t taken with him at all, the actual content of the date was enjoyable. We went to the 3 Rivers Arts Festival and pretty much gallery hopped for a few hours. Despite the fact that it was about nine million degrees out, we managed to cover a fair amount of ground and see a fair amount of artwork. My personal favorites being Corrugated Fountain by James Grashow and Hysterical Machines by Bill Vorn. I actually think I’m going to try to check them both out again before they leave Pittsburgh so that I can have a chance to experience them without any distractions. But seriously, click on that link to Hysterical Machines. You won’t be disappointed. Attending the arts festival made me realize that I really need to make more a point to take advantage of everything The Cultural District has to offer, especially since I’m downtown, at the very least, five days a week. It seems silly to have this amazing wealth of entertainment sitting right in my face and not take advantage of it on a more frequent basis. I really would write more, but I feel vaguely like death and I would like to be able to go to work tomorrow, so I will end this entry here before my head explodes. Asian snacks are too cute for their own good. Today during lunch, I ended up walking around the Strip District and going into Lotus Food and buying a ton of Asian snack food (plus some chip clips and incense) because I figured that it would make a fun post and it would be cool to try a lot of different snacks. Everything pictured came up to well under $20 total, so not bad at all, pricewise. That said, my bag of purchases sitting on my desk totally did distract me for the second half of the work day, but oh well, small price to pay, right?